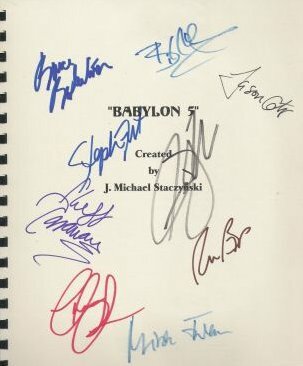 Great script from Babylon 5 Episode #316 "War Without End Part One" personally signed by Bruce Boxleitner, Jerry Doyle, Claudia Christian, Mira Furlan, Richard BIggs, Bill Mumy, Stephen Furst, Jason Carter, and Jeff Conaway. Please note: This script did not belong to the cast or crew, but is a copy of the original. The signatures are NOT copies, however, and are still hand signed in the same fashion as our other items! Scripts are usually kept by cast/crew members at the end of shoots. Also, as they have a lot of changes made to them while filming is taking place, almost any original script will have colored pages and show signs of wear and tear. Value: $300.